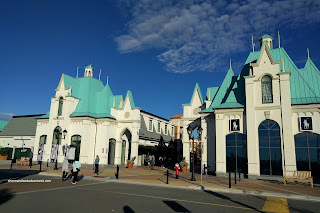 So what is the first thing that comes to mind when we think of McArthurGlen? Okay, let's see... Airport, Richmond, Designer, Luxurious, High-End, Airplanes... How about food? 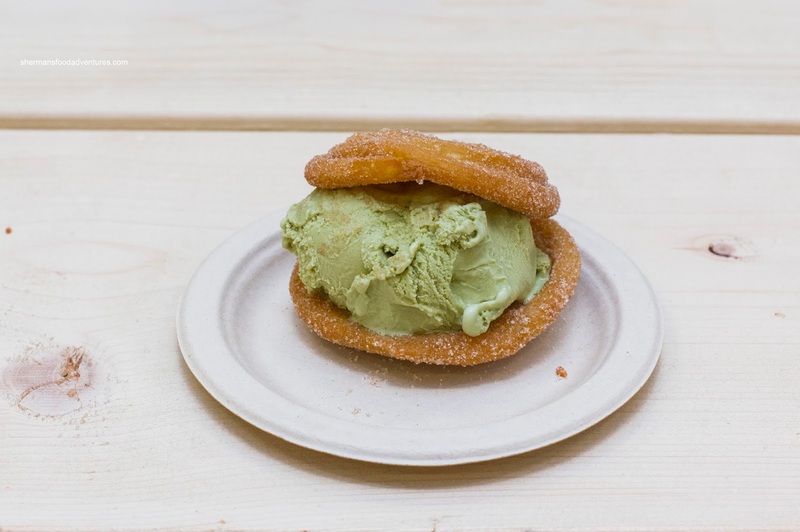 Ever since it opened, there have been gradual additions in terms of restaurants and food choices including Caffe Artigiano, Neptune Wonton, The BiBo, Japadog, Hugo's Churros and Ryuu Japanese Kitchen (with 2 more in the works, Qoola being one of them). When phase 2 is completed, there are even more on the horizon. 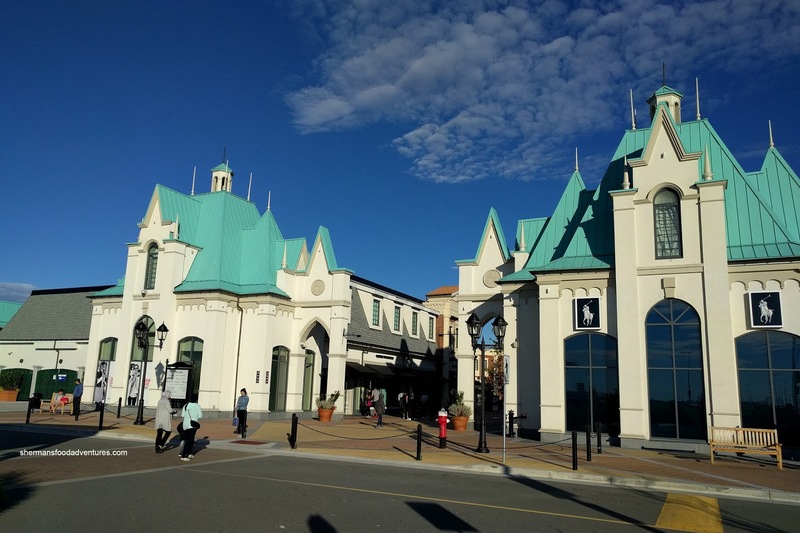 For now, we were invited to try 4 of them as a means to exhibit the other side of the outlet mall. 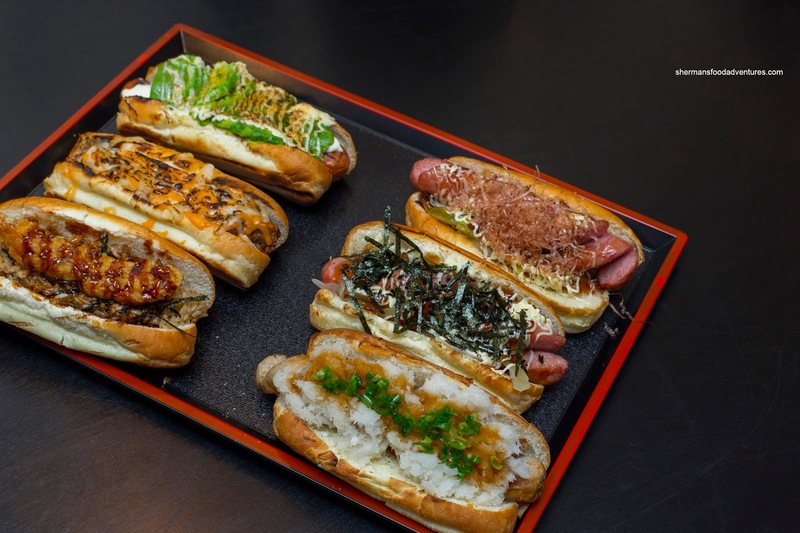 We started off at a familiar name in Japadog. Here we were presented with a tray consisting of 3 classics and 3 newer items. 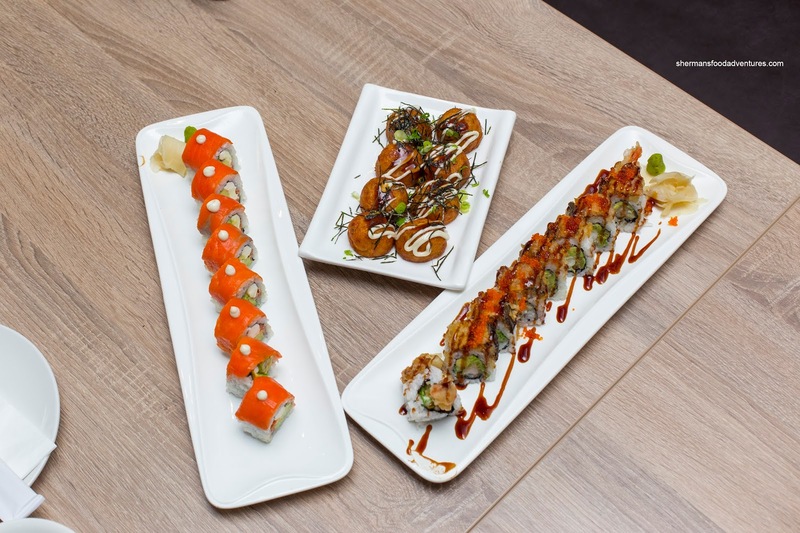 These included their most popular items being the Terimayo, Oroshi and Okonomi. There were also 3 I've never tried before in the Ebi Tempura, Love Meat and Avocado. For me, the Terimayo still rocked with the tasty combination of mayo, teriyaki sauce, onions and nori. 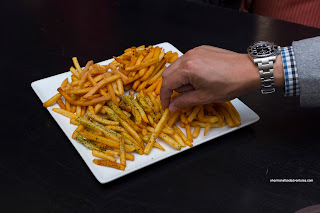 We were also served their Shaked Fries in 4 flavours - Aonori, Butter & Shoyu, Ume, Katsuo and Shichimi & Garlic. I've had these before and they are relatively crispy considering that they are tossed in wet ingredients. I personally love the shichimi and garlic due to the spiciness and also the butter & shoyu. From there, we walked next door to Ryuu Japanese Kitchen where we were served Takoyaki, Philly Roll and Dragon Roll. Surprisingly, my favourite item was the Takoyaki as it was warm and appealingly soft with a tender pieces of octopus. It was dressed just enough for flavour without being too saucy. I found the sushi rice for the rolls on the softer side, but it was hardly mushy. The rolls were carefully constructed where they appeared clean and stayed in one piece when picked up. I preferred the dragon roll since I've never been a fan of cream cheese in my sushi. 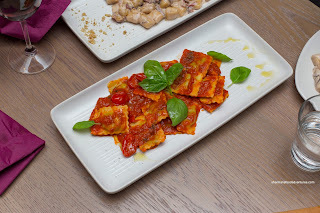 If we weren't a satisfied with some of the bites we'd had so far, our appetites were easily quenched at The BiBo. In addition to both Meat & Cheese Boards, we were served 2 different pastas including Gnocchi with a creamy sauce & Italian mushrooms as well as Ravioli stuffed with ricotta and spinach served with Italian datterini tomato sauce. 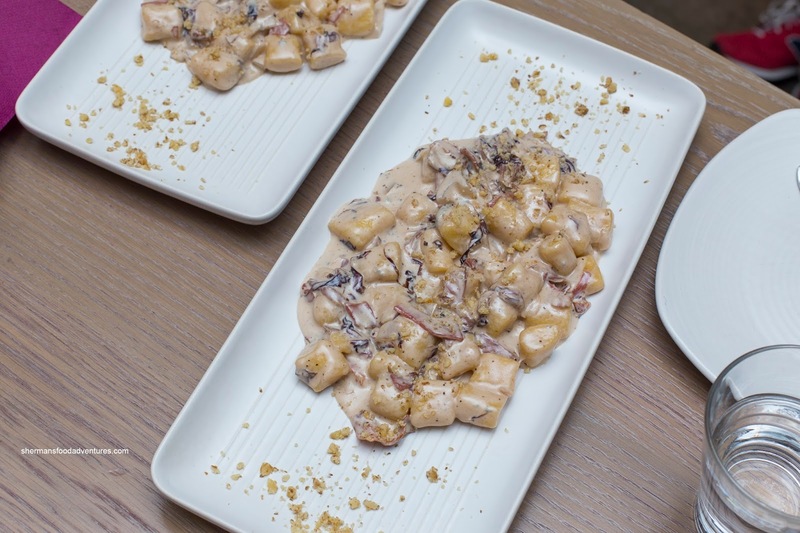 I found both pastas to be on point where the gnocchi was tender with only a mild density. The ravioli was al dente and not over-stuffed where it maintained its texture with every bite. I preferred the tomato sauce more though as it was bright and flavourful. 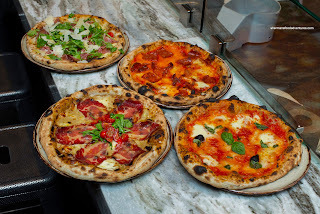 Moving onto the Neapolitan-style pizzas, we were served 4 of them including the Margherita, Diavola, Montanara and Crudo. For me, the classic and simple Margherita did the trick for me. Its simplicity meant the crust stayed more dry where it was thin and chewy with a semi-charred exterior. I also enjoyed the Montanara with only a touch of truffle which was enhanced by the porcini cream. The Diavola was a bit salty due to the pepperoni, but the pizza stayed dry which meant the crust was not soggy. Our last stop was at Hugo's Churros where we sampled the soon-to-be-released Hot Chocolate dip with churros. This was addictively tasty with a thick and rich chocolate dip that was purposefully sweet. It featured marshmallow fluff on top which made the mixture sweeter (otherwise, the chocolate alone had a nice bitterness). 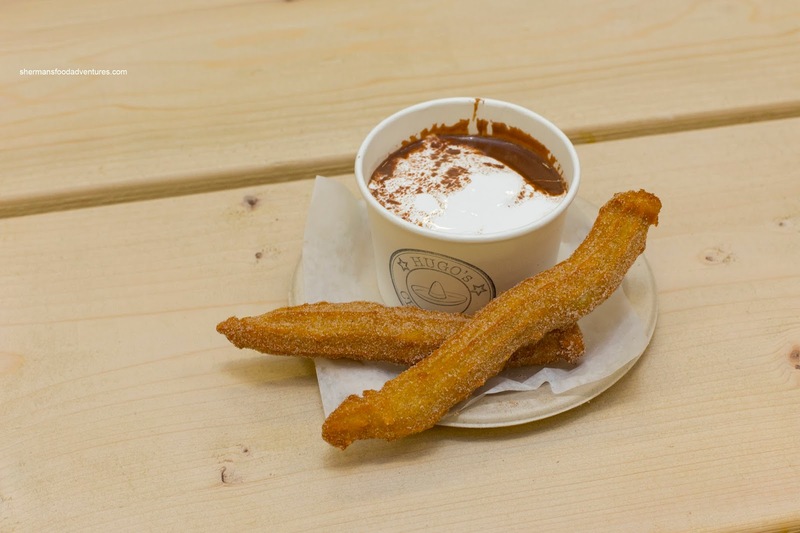 The crunchy churros went well with the silky hot chocolate. 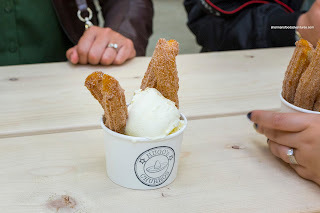 We also had the Gelato with churros and this was a pretty sweet concoction. I found the gelato to be richly creamy though.